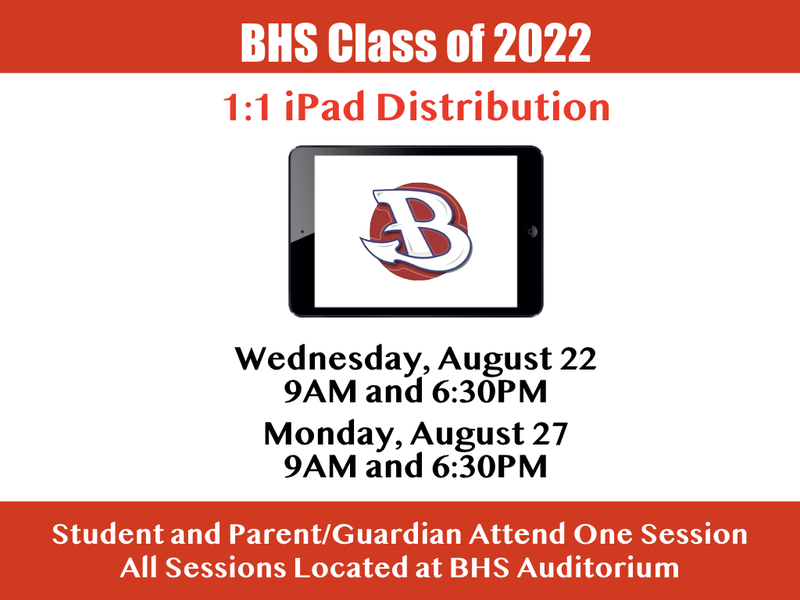 Burlington High School incoming freshmen for the Class of 2022 will receive new devices during distribution sessions this August. BHS freshmen will continue the Burlington Public Schools 1:1 Learning Program with iPads this year. The decision to select iPads again for freshmen came after careful consideration and ongoing discussion with teachers and students. Burlington Public Schools continues to focus on providing the best learning tools for our students. Each student must attend one session with a parent or guardian. The session includes a brief Technology and iPad Orientation presentation that must be viewed by students and parent/guardian. Students and parent/guardian will review the Burlington Public Schools Acceptable Use Policy, Device Responsibility Policy, and iPad insurance options. There is no registration for sessions. Students must select and attend ONE session. All sessions will be held at the Burlington High School Auditorium. The sessions will last approximately 45 minutes.